I don’t like to put it allll out there. In fact, that’s why I have a blog. I have a tendency to go on and on about things I love and I’m sure no one really cares. I figured if I put it on a blog, I would be able to express myself without boring people. My kindred spirits who geek out equally as hard over food, books, and Bravo tv can find my babbling here on this blog and we could rejoice together. Of course, even then I’m only showing my best self. I mostly just post about the good restaurants, and I never tell you about all the recipes I attempt that come out terribly. Why show off my failures? It’s embarrassing and embarrassment is a close neighbor to shame and hurt. Those are not feelings one wants to celebrate. Thank goodness for Instagram, right? There, I get to add filters! Oh the filters! Everything looks fab in an old timey sepia tone. I always look like I’m having the BEST time, don’t I? You never see the moments when I’m homesick. I am extremely close with my family and miss them daily. I fear I’ll miss out on my nephew/godson’s milestone moments. I yearn for the beautiful marsh outside my childhood bedroom window. And my job is not always perfect. Not even close. I may get a few fun perks, but between the lunches and outings I have, at times, felt so overwhelmed that it seems I’ll never crawl out from under the work. And then there’s the worrying I do when I am concerned I am way behind on the marriage/baby track. And now there is the stress I’ve just accumulated in writing all this down. I’m exhausted. But those are all major, somewhat abstract issues. There’s also all the day-to-day stuff I don’t want to share with you. Today, however, I’m going to bare it all. I am partnering up with Quarterlette to share #MyUncuratedSelf. I’m going to give you a sneak peek into an authentic Tess that – in Instagram speak – has #nofilter. Over the weekend Albert and I went to a wedding and I came down with food poisoning. Thankfully, I didn’t have to miss much of the weekend’s events, but that doesn’t mean it was smooth sailing. I sure look like I’m having fun in that picture, right? Well, just a couple hours after the photo was taken I woke up and I. Was. Miserable. I raced to the bathroom and spent the next hour locked inside. Without going into too much detail, I’ll just tell you that it was like a one-woman re-enactment of that infamous scene in the movie “Bridesmaids.” Sure sure, everybody’s been there (or so they try to comfort you). But has everybody been there when they’re sharing a small hotel room with another couple? I was HUMILIATED. As I was lying on the tile floor at 2:30 AM one of the first things that came to mind was having to see the other couple in the morning. I’m sure they heard it all and it wasn’t pretty. 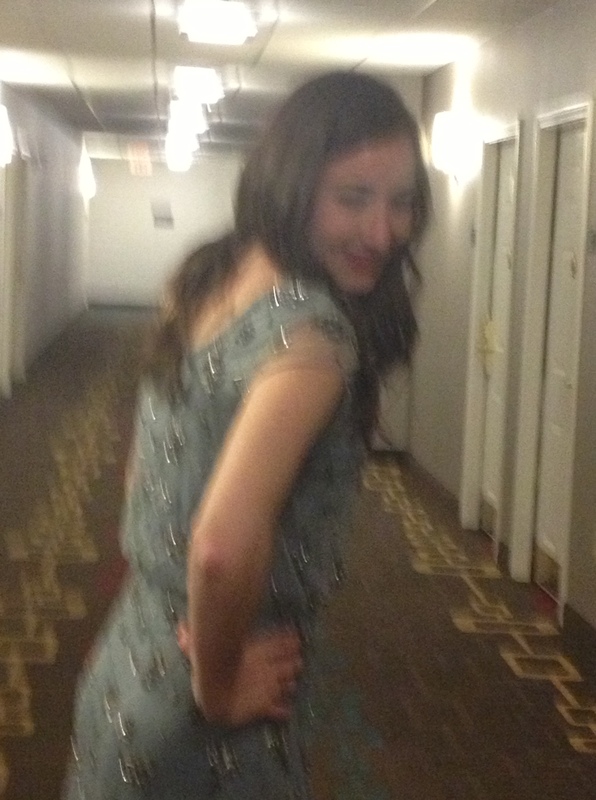 Then I have to explain why I wasn’t at the afterparty. I managed to laugh and change the subject, never admitting the gross-ness of the night before. Now I’m letting you all know. It’s not always pretty behind the Instagram filters but it’s all me. 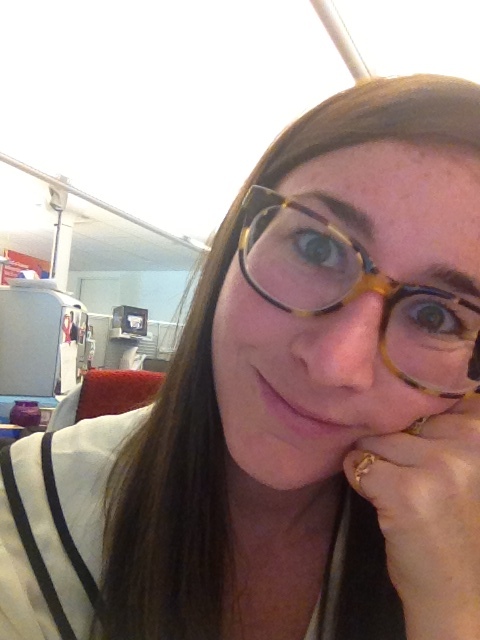 Bad office lighting, no makeup, and glasses: it’s not always Insta-worthy. Tags: Beauty, Photography, Quarterlette. Bookmark the permalink.